SHIN SPLINTS…two words a runner NEVER wants to hear. But unfortunately, it’s a recurring problem for many runners of all skill levels. In fact, shin splints account for 10-15 percent of ALL running injuries every year. I know…who thought a shin could cause so much pain for so many runners? They don’t sound painful looking from the outside in, but that’s until you experience them. Trust me, I’ve been there, the pain from shin splints can stop you dead in your tracks. If you are experiencing pain below the knee but above the ankle when running, you may be wondering what’s going on. And most importantly, you may be in search for a way to stop the pain. No one at any experience level wants to feel pain from injury when they run…I know I don’t. Here’s the thing: although running is challenging, it shouldn’t be a painful process. Yes, you suffer at times, and some pain you should push through. But overall, running should be an enjoyable experience. No runner should ever push through an injury…NO runner. Here’s the good news (yes there’s good news! ): by using the right running shoe, you have the potential to prevent and even stop shin splints. But it all starts with the understanding of shin splints and why they develop. So first, let’s go over precisely what shin splints are. We will then discuss the difference between standard running shoes and shoes designed for shin splints. Next, we will touch on the benefits of choosing the right shoe for YOU and finish with the top 10 best shoes for shin splints in 2019. Sound like some useful information worth reading? If you are experiencing shin splints, then I bet your answer is…ABSOLUTELY. Oh…by the way, you have just stumbled upon one of the best running shoe guides for shin splints out today. So, let’s get started and help get rid of your shin splints for good. It’s time for YOU to take charge…not your injury. What are shin splints exactly? How do shin splints develop and what can be done about it? How do shin splint running shoes differ from standard running shoes? As mentioned, shin splints are lower leg pain. Specifically, it’s a pain that occurs below the knee but above the ankle. Most runners think shin splint pain is only located on the front of the leg. But the truth is, the pain can occur on either the front outside of the leg OR the inside. Simply put, it’s any pain that surrounds your shin bone from any angle. And although the explanation isn’t complicated, stopping shin splints can be a bit more involved. They have the potential to be a minor nuisance or a running ending injury. So, let’s get them under control starting TODAY. And again, trust me, I know, I’ve been there. I’ve had my own battle with shin splints, and I can tell you after I made a few adjustments, I never experienced them again. So, if you keep reading, I will help you do the same. Remember this: Shin splints are known as the “too much too soon” injury. Shin splints typically occur from building up your mileage too quickly and doing so with a shoe that does not compliment your footstrike. Do you see the self-sabotaging cycle? Not only are you progressing too fast for your body to adapt to its new stresses, but you are doing so in a shoe that is completely throwing off the balance of your body. Now you’re putting too much force on one side, like the side of your shins! Then you wonder why your shin splints have become a recurring pain and not just a one-time issue. Here’s when you become a frustrated runner. How can you progress as a runner when every time you run faster or longer you are stopped by the painful sting of a shin splint? How can you when the more you run, the more injured you become? And here’s the worst part of all–if you keep running on painful shins, then your common overuse injury can turn into an acute injury like a stress fracture. That’s a quick way to put you out of commission…and FAST. So how do you treat shin splints? How do you get rid of the pain? Not bad…right? Remember–one without the other and you’re just spinning wheels in the healing process. But here’s the best news of all: running shoes that help with shin splints will also compensate for poor form! So, once you have the right running shoe, you can work towards a proper running technique. 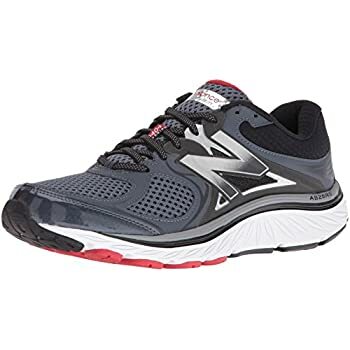 The moment you begin running in a shoe designed for shin splints and your footstrike is the moment you start eliminating shin splints for good. So, before we pick out a shoe, let’s jump into the differences between a standard running shoe and one designed to help with shin splints. Knowing the difference will help you pick out a running shoe that’s best for YOU and your style of running. This may surprise you, but there aren’t “shin splint” running shoes. No, you will not find a quality running shoe that is ONLY designed for shin splints, they do not exist. However, what you will find are running shoes that are designed to assist. These running shoes will have cushion…and A LOT of it. Extra cushion will help absorb the shock caused by striking the ground. That’s versus the force making its way to your lower legs where your shins are located. Next, shoes designed to help with shin splints will be supportive. This way your body will have a balanced and natural stride also providing relief to your shins. So, it’s critical to find a running shoe that’s supportive of your footstrike in addition to superior cushioning. For example, if you have flat feet, you most likely overpronate. This will cause an inward roll thus providing more force to one side of your leg. Enough force in one place and you can cause injury, like shin splints. Your knees will most likely hurt too. So, if you buy a shoe that’s supportive for overpronators, you rebalance your body and spread the force out equally throughout your legs. Then add in more cushion to absorb shock, and you’re on a direct path to an injury-free running experience. Remember this: running shoes cannot be standardized. A shoe that provides relief for your running style may not provide relief for another. Extra cushion to absorb shock. Supportive to balance your body. Motion control to help with form. Low heel drop to relieve pressure on your shins. Snug fit to prevent movement inside your shoe. Flexibility so your shins can stretch. A new model so you can buy multiple pairs since a worn shoe can also cause shin splints. Arch support to help absorb shock. Extra cushion on the heel to support those who heel strike. Now that you understand what to look for in running shoes for shin splints, let’s quickly discuss the benefits. Better running form. Yes, finding the right shoe to match your footstrike will help your body align and promote good form. Plus, because of this better form, you will have more time to work on a solid technique without worrying about further pain from shin splints. More flexibility. With no pain in your shins, you have more mobility in your strides. This will help prevent injury. Long lasting shoes. When your body is striking the ground evenly, your shoes will not wear out prematurely. That means less money on shoes and more miles running. Comfortably run on hard surfaces. Shoes designed for shin splints have added cushion. Relief for flat feet. Runners with flat feet will no longer be prone to shin splints. Run faster. That’s right, no more holding back because of shin pain. You will gain more freedom to let off the brakes and run to your true potential. Now that you know the benefits of a running shoe that helps with shin splints, it’s time to move on to the fun stuff. 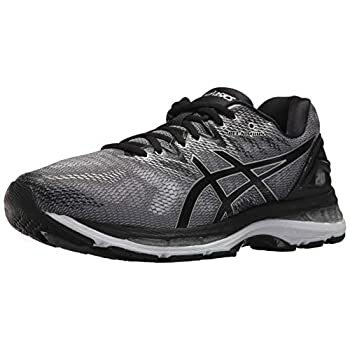 Next, I will provide a review for the top 10 best running shoes for shin splints in 2019. 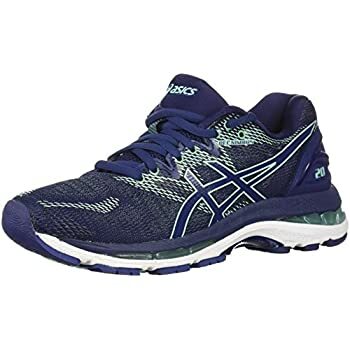 Right here…the Asics Gel Nimbus 20’s, are the best shoe you will find for shin splints if you are a neutral runner. What they do really well is absorb shock, and that’s a key to eliminating shin splints. The cushion of the shoe is literally built into its name. The “GEL” in Gel Nimbus is referring to its rearfoot and forefoot GEL Cushioning System. You will notice the GEL technology is designed in the rearfoot as well. This is essential since most runner’s heel strike. Extra cushion all throughout the shoe to absorb shock which helps to prevent injury. Its users say it fits to size, so no time-consuming returns. Referred by orthopedics from around the world…should I say more? Breathable upper section to provide even more comfort to your run. Too narrow for some runners with wide feet. Sometimes when you buy a comfortable shoe, they can be heavy. You get stuck in a dilemma of choosing between comfort+support or lightweight+fast. But what Hoka One One does the best I think is provide a running shoe that is not only the most comfortable in the industry but lightweight as well. That’s why many ultramarathon and mountain runners use Hoka One One running shoes. So, where does the Hoka One One Clifton 4’s come in on the cushion scale? The TOP. 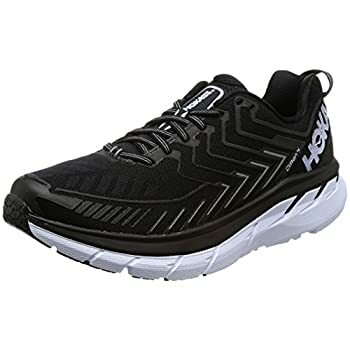 Yes, this is Hoka One One’s most cushioned shoe. If a runner who runs 100 mile races says they are comfortable, then YES, I’d say THEY ARE COMFORTABLE and ABSORB SHOCK. For a neutral runner, this may be the answer to your shin splint problems. Between its low heel-to-toe drop, excess foam, and 3D puff print frame, you have the comfort and support you need to take your running to the next level. The smooth ride is felt instantaneously. Now, remember, Hoka One One shoes have a large sole. They will take some time getting used to, but when you do, I hear it’s an incredible experience. Its users say once you experience the Hoka One One way of running…you will never go back. 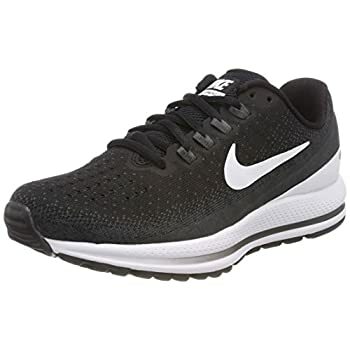 Excellent cushioning and lightweight to provide a smooth, comfortable, and fast ride. Its stability will keep your running form in check and body balanced to prevent injury. Soft upper mesh provides additional comfort. Roomy toe box will let your toes breath and provide room for them to expand. Hoka One One has a great return policy and guarantee …check it out. Tall soles take time to get used to. If you have flat feet, then chances are you overpronate…I know I do. And if you overpronate you may experience shin splints…I know I have. Well, the Asics Gel Kayano 25 will help with both. That is, it will compensate for your overpronation thus preventing shin splints and providing a platform for the healing process to begin. 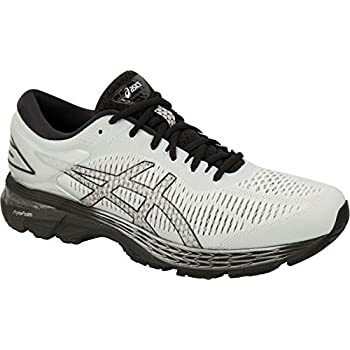 First, they offer the Asics signature GEL technology. The same technology found in the GEL-Nimbus’s. So, it goes without saying its shock absorption is superior. Then add in its Impact Guidance System to help with overpronation, and you have right in front of you a flat foot long distance runner’s dream shoe. That is, a supportive running shoe to get you through those miles, those long, LONG miles. So, whether you are looking for a shoe for exercise or one to lace up and train for your next race, if you overpronate, this is one of your best options. Now you will run with much better form preventing stress causing injuries like shin splints and runner’s knee. Its users praise this shoe for its superior comfort and long lifespan. Superior cushion to absorb shock and provide a smooth running experience. Lightweight so you can run with a little extra speed. Excellent shoe for running long distances like half or full marathons. Supportive of promoting a natural stride thus preventing injury. Stability in a running shoe helps keep your foot from rolling in and relieves pressure on your shins. And in my opinion, New Balance is the industry leader when it comes to stability. 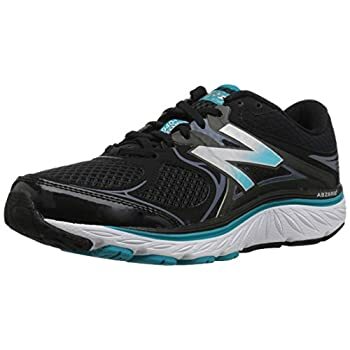 So, if you are looking for a smooth, stable, and cushioned ride, then give the New Balance 940V3’s a try. 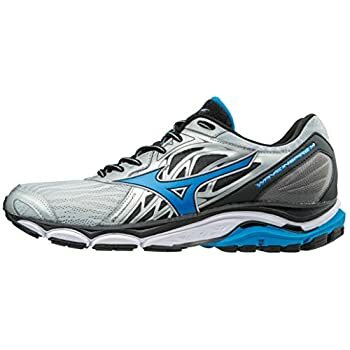 Made for overpronators, this shoe is excellent for running long distances. I’ve run in New Balances for years, and their quality is always top notch. No, they don’t come with a laundry list of special features and innovative technologies, but they get the job done, and they do it well. 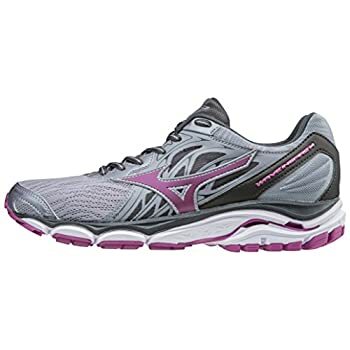 One of the best benefits for this shoe its full-length ABZORB cushioning. This wraps under the entire foot providing superior cushion and shock absorption. Bigger runners love this shoe and flat foot runners praise it for preventing injury. A perfect combination of comfort and support with its T-BEAM support and ABZORB cushioning to prevent injury. Unique medial post design provides control for those who overpronate promoting a more natural stride. Simple design and extremely durable for a long life span, yes, you get your money’s worth with this shoe. New Balance is one of the top companies when it comes to running shoes. Great price for excellent quality. Too simple for those who like features. 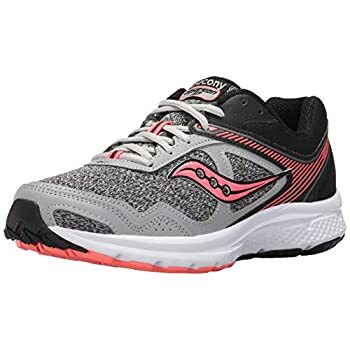 The Saucony cohesion is an excellent neutral cushion shoe for all runners whether it’s your first time putting on running shoes or the millionth. That’s why they are so popular. They are a top choice for beginners who want to advance to a more experienced runner. So, whether you take them out for a quick jog around the block, a fast treadmill workout at the gym, or a long training run, you can rely on this shoe. However, I wouldn’t use them for marathon training. Shoe companies like the Asics, Brooks, and New Balance are better for the really long stuff. 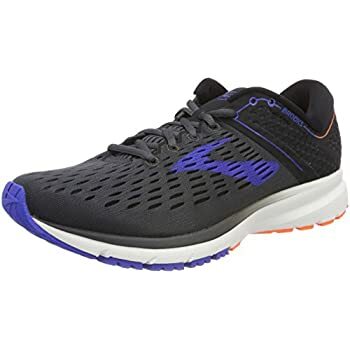 Through their injection-molded EVA and GRID technology, this running shoe becomes one of the most reliable and comfortable shoes on the market today. Its users praise it for its comfy and lightweight feel. Some users have even gone as far to say they have eliminated all their lower leg pain. 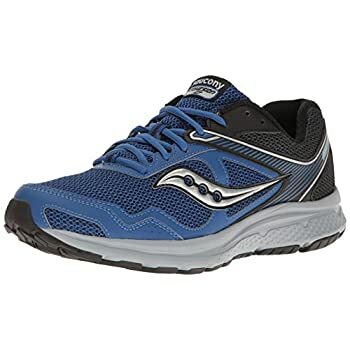 Made by Saucony, a leader in the athletic market, so you can rely on them. Superior comfort for runners of all sizes. Great breathability from their upper mesh, so it’s an excellent option for running on a hot day. Excellent traction for a road shoe. Extra shock absorption to redirect impact from your lower legs. If you are looking for an innovation shoe design which is a leader in shock absorption, then look no further than the Wave Inspire 14. Mizuno provides an innovative wave technology to their shoes. It’s inspired by nature and mimics the way waves work. Within the shoe is a wave plate that disperses energy from impact when your feet strike the ground. The plate allows the shock a broader area which provides a superior smooth and stable ride. As you can imagine…an excellent way to prevent shin splints. Even with all its innovative technology they still remain incredibly flexible, grippy, and snug. Although there are no guarantees, this shoe has been answering the prayers of many injured runners who suffer from overuse injuries. You’ll get both moderate stability and their dynamotion FIT for guidance through the entire heel to toe transition. It’s responsive, fast, and great for both short and long runs alike. Its users love its wave technology, some say it’s one of a kind. Excellent cushion and shock absorption from its innovative wave technology. Fast and responsive for a quick and springy stride. Extra room in the toe box…who doesn’t like a little wiggle room? Lightweight in nature for fast transitions. Higher price for a less known company. Heel drop is a bit on the higher side. When I think of the Brooks running company, I think of marathon running. 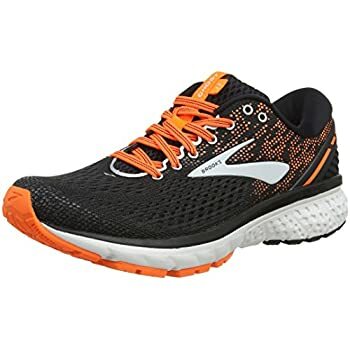 So, if you are looking for a neutral shoe, are dealing with shin splints, and want to run longer distances, then take a look at the Brooks Ghost 11. With this shoe, you get excellent cushion through their segmented crash pad and their well-known BioMoGo DNA foam midsole. 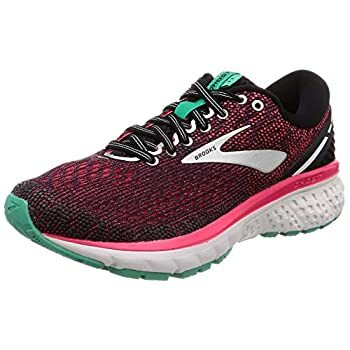 I’ve personally run in Brook’s shoes, and they are indeed built for distance runners, many marathon runners swear by them. Excellent cushioning for a more comfortable long run. Excellent grip for slippery roads or even some light trails. Upper mesh is both breathable and comfortable. It’s made by Brooks, so you know they are superior on longer runs like half and full marathon training. Not good for runners with flat feet. The extra grip means extra weight. As long as it meshes with your footstrike, you can’t go wrong with a Nike running shoe. They’ve been designing running shoes since the beginning of time. Nike has found a way not just to make an affordable shoe, but to provide multiple color options and an exceptional lifespan. So let’s discuss the Nike Air Zoom Vomero 13. One of its best features is its Flywire technology. To sum it up, this technology prevents your feet from slipping in any direction. As you can imagine, this helps keep your body balanced when your foot strikes the ground. This prevents overuse injuries like shin splints, plantar fasciitis, and runner’s knee. Remember–they are a neutral shoe, so high arch and flat feet runners should stay away. 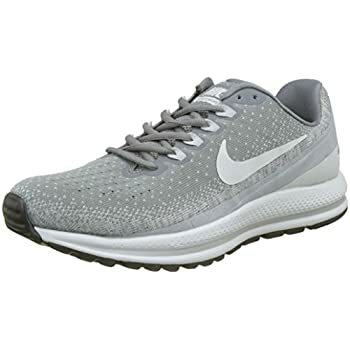 But if you have a neutral footstrike, you can benefit significantly from this running shoe. They are also super snug providing even more stability and comfort. It’s even packed with Lunarlon foam for extra cushion and vents well too. Its users love its design, but hey…its Nike, what else would you expect? Extra foam provides an excellent cushion for superior shock absorption and comfort. Breathable mesh and a lightweight feel. Flywire technology allows you to stride with confidence. Wears out early for some. Only made for neutral runners. I personally had the pleasure of testing this shoe for Brooks when they were first released. I trained and ran a marathon in them. As a runner with flat feet, I’d say they weren’t as supportive as some other running shoes. But running shoes can’t have it all, for example, for a comfortable and supportive shoe you usually get a slower shoe with extra weight. Overall, this shoe was light and responsive with moderate support and cushion. 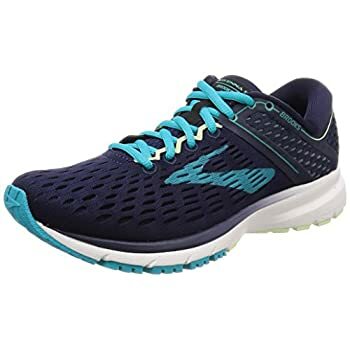 Anyway, if you are a neutral to light pronator with mid arches who wants to run long distances like marathons, these may be an option for you. With mild support and extra cushion, they absorb shock but still provide a responsive spring for speed. You could even use them as a stepping stone to a more minimalist style shoe. 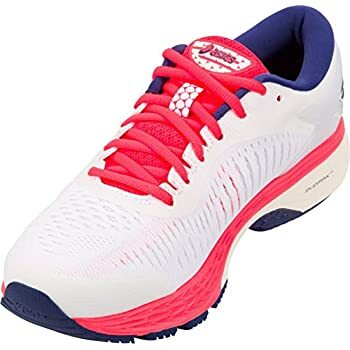 It has the BioMoGo DNA biodegradable cushioning like most Brook shoes and an upper mesh design for extra breathability. It’s users love this shoe for running marathons. Excellent cushion for long runs like marathons. A responsive “springy” feel to promote a faster run. A snug fit so it’s both comfortable and supportive for a more confident stride. Promoted as a shoe for overpronation but may not be the best option. The Salmon Speed Cross 4 is one rugged running shoe. 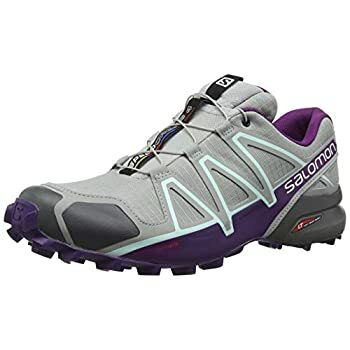 Built for the trails, it has MONSTER grip and is an excellent choice for trail runners or runners who want to start running trails. 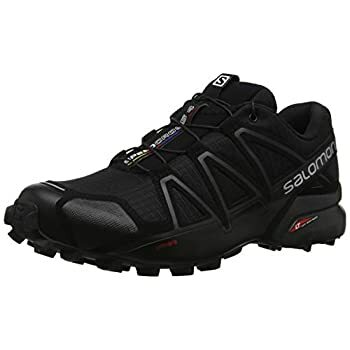 This running shoe is both lightweight and cushioned and keeps your lower legs protected during long trail adventures. Plus, running on trails are better for the legs in regards to shock absorption because of their soft surfaces. This alone helps relieve overuse injuries like shin splints. Here’s the thing, Salmon is one of the top companies in trail running. They specialize in the trail running community. Mountain runners and ultramarathon runners support their products. With that said, you know their products are durable and built with excellent quality. It’s users love this shoe for its reliability for technical off-road training. Excellent grip for the toughest of terrain but not too much for some fast single tracks. A lightweight trail shoe for faster long runs. Its Sensifit technology provides a lacing system that keeps your foot secure and snug. Its Contagrip provides excellent wet traction. Trail shoes are neutral, so it may cause issues for beginner overpronators. So, there you have it, 10 of the top running shoes you can choose TODAY to help with shin splints. As you can see, these shoes are designed to absorb shock and help promote proper running form. The combination will add a much-needed relief to your shins and allow you to run further with less or no pain. Well, that’s if you choose a shoe that’s best for you. So pick your running shoe, start slow, progress slow, and allow your body time to adapt to its new running shoe and hopefully you can say goodbye to shin splints for good.